Now if you would just write this in English. Do I smell a troll here? Trying to get another "equilateral triangle" thread started? You forgot to insert your spam link. Please explain what you are mitering framing the stairway? Your sizes for the parts are typical but can be altered for each application. Most of us plan a stairway in terms of rise and run. The size of the risers are determined by how much space there is between the first level and the upper level. The run is usually determined by how many treads there are but in some cases the stairway can be made steep when space is limited. In this case the treads can be made smaller. Step #1, throw away construction master iv calc. Step #2, use a spamulator master iv calc. Step #3, If you are still stuck, google Ted's Woodworking plans. ok guys, this is not spam and yes i think ya'll are cute. i have a deck that where the steps are going is a 45 degree angle. my total rise is from ground to finished height is 26 inches. i am making my finish threads @ 12 inches. so i am cutting my risers, 6.5 rise and 11 inch thread for a total of 3 treads. these will fit the two sides sq. my question is how do i compute the king tread that connects the two that is on a 22.5 degree angle from the sq. ones. strings and straight edge will work, just thought i could get and answer from here. (a sq + b sq = c sq) using 11 inch did not work. thanks, this was my first question to this forum, hope i made your day. Soon after I made my reply here (post #3), the link in that thread got deleted. If that's not spam...what was it? I see a lot of guys out there with their electronic gadgets that they hope will allow them to push enough buttons to come up with a simple answer. I also see a lot of stuff in the burn pile 'cause they trusted these things. As an old timer, I use mockups so I can see it. Take some scraps and clamps and screws and build a life-size model of it right on the deck so you can see it. I get the impression that you have purchased precut stringers to build your stairs. I make my own so the angle is not something under consideration except for fitting it in. Trying to rise 26" in three steps is a little too steep in my opinion. Your rise would have to be a little more than 8 5/8" per step to do it in three steps. Your 6 1/2" riser will work for four steps however the 6 1/2" includes the thickness of the tread. If you have a precut stringers you can recut them to achieve this. Some people cut them where the top and bottom riser is smaller to keep from doing this but I personally don't like it. 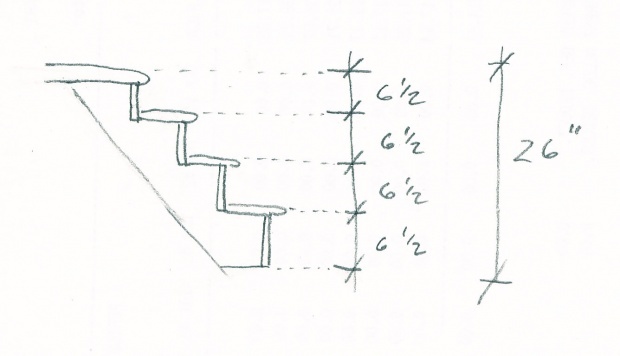 I have a construction calculator also and it is quite useful for many things but the old fashioned way is still the best for laying out stairs. I use a framing square and stair gauges. Just attache the gauges to the edge of the square so that when you rest it against the edge of the stringer it will mark the rise and run you desire, mark, slide to the next position. Once one stringer is cut, check it for fit and use it as a pattern for the others. I know that a 5/12 angle on the square is 22.5 degrees. 6.5/11 is not the same aspect ratio and would be a different angle. If memory serves me, seems like stair stringers are usually about a 37 degree angle or so. There are whole books written on how to use a framing square. An amazing tool if one takes the time to learn how to use one.